It’s a natural! 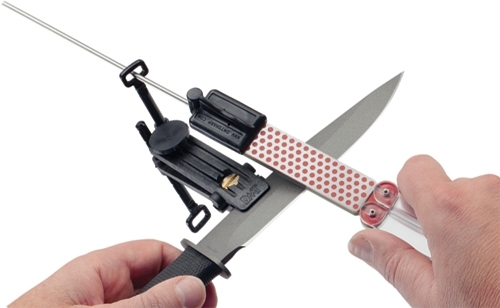 The Double Sided Diafold® Sharpener offers portable, two-stone sharpening at its best, the Aligner™ Blade Guide (ABG) provides 7-Angle adjustability for the right edge every time, and the MAG – Magnetic Angle Guide joins the two! The Double Sided Diafold® Sharpener offers two 4" x 1" Diamond Whetstone™ surfaces in one lightweight, portable sharpener. Multi-use on blades, kitchen knives, specialty and garden tools, etc. It's conveniently sized at 9 1/2" when open and 5" when closed. Folding plastic handles protect the sharpener when not in use. Both novice and professional will appreciate the Aligner Blade Guide to create precise, professional, consistent sharpening results. Accommodates wider blades as well as standard blade thicknesses. Easy-to-follow instructions included. Sharpens in a fraction of the time required by conventional stones. No messy oils needed -- sharpen dry or with water. Durable construction will provide years of consistent performance and reliable service. For proper tool maintenance, woodworkers, chefs and other professionals rely on the superior quality and versatility of DMT® products. Made in USA.